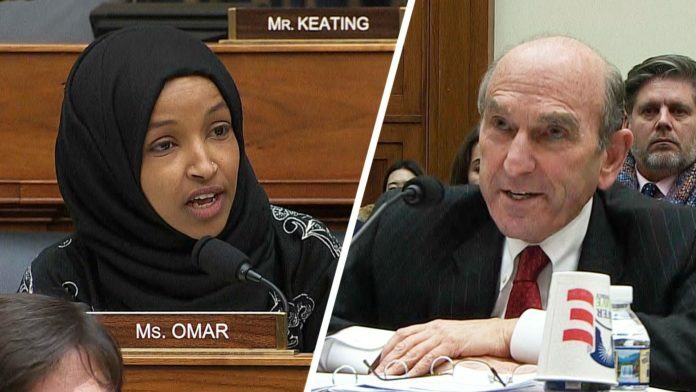 During a testimony before the House Foreign Affairs Committee on Wednesday, Rep. Ilhan Omar grilled Trump administration official Elliott Abrams, accusing the diplomat of being a liar and pressing him on his involvement in the 1980s Iran-Contra affair and killings in Central America during the Reagan administration – WITHOUT ALLOWING HIM TO RESPOND. “I don’t understand why members of this committee or the American people should find any testimony that you give today to be truthful,” she said. Meanwhile, many are still demanding Omar’s removal from the House Foreign Affairs Committee over her anti-Semitic tweets. Abrams, the Trump administration’s Special Envoy to Venezuela, told the committee he believes increasing international pressure will eventually lead to the ouster of President Nicolas Maduro. Abrams testified comes about a month after the U.S. took the unusual step of recognizing opposition leader Juan Guaido as interim president. This wich can not put one word in front of the next. Iran corta and farthered values. While it may not have been the most appropriate way to ask the question (I’ve heard worse from both parties), she was asking a legitimate question. Antisemitic, American-hating radical Muslim can come to US from hostile country, get into Congress and start dictating US foreign policy? Something wrong with this picture. Bad decision on her part to go in front of a camera. Now the country knows that she is functionally illiterate, as well as a racist. Not a single grammatically correct sentence in the bunch! Without the notes that one of her aides wrote for her, she would have had nothing to say. This women is a poison for the Jewish Community. The US Democrats did open largely the door for her and for Islam. It corresponds to the new (black) face of the antisemitism all around the World. Nikki Haley would have answered her so perfectly, Ms Ilhan Omar would have been speechless, and tuned blue (and white, Israeli flag colors). Abraham Mansson- you are a racist and you it very comfortably in the Republican party. rabbiofberlin, stop preaching us your phony virtue signalling “morality”. If your are a real “rabbi” of berlin, please stay there and preach your love for all Jew-haters there. Abrams is a convicted war criminal. Has everyone forgotten that fact? Mrs. “Israel has hypnotized the word” Omar shows her true feelings about America in this attack on Abrams. What chutzpah for her to proclaim that whatever he will answer will not be truthful before questioning him! Her evil nature came out right after the word “massacre” when she asked “Do you think that massacre [smirk] was a fabulous achievement?” He answers “no” and she takes it as a yes! Shame on the Democrats for allowing her to remain on the Foreign Affairs Panel.